Just following Jesus in my real life...: Strawberry Season! The local Oregon strawberries from the fields around Mt. Hood are ripe! That means it's officially jam making time! 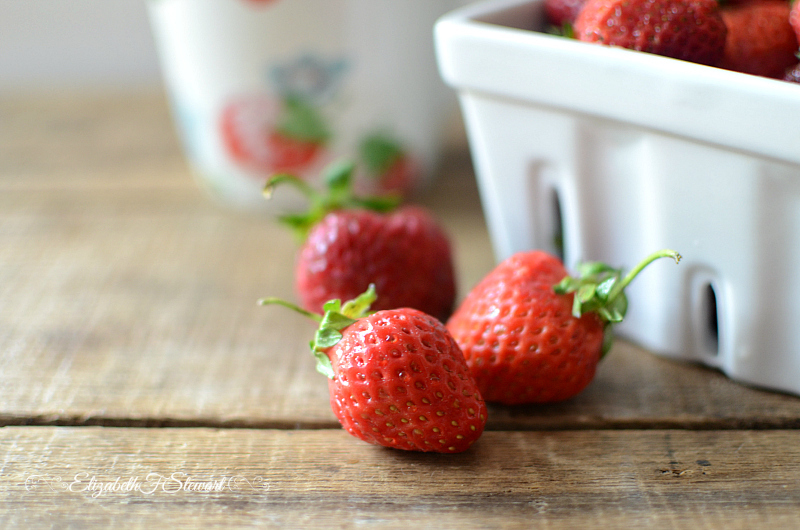 Nothing could be easier to make than strawberry freezer jam! add the pectin and lemon juice and stir, "et voilà" you have jam! but much more flavorful and sweet in my opinion. Robin's Yummy Strawberry Cake and Strawberry Cream Cheese Hand Pies are running through my mind. or greek yogurt topped with homemade granola and sliced strawberries. I'll be buying more strawberries and making more jam before the season is over. Of course, then comes raspberry, blueberry and blackberry season! Your pictures are just perfect - that mug!!! We gobbled up the berries we bought last week and I need to stop and get more. They are so delicious! I plan to get more as well! Can't get enough of them! Love your pictures! We're going to go pick strawberries this weekend for jam. I plan to make another batch of jam or two before the season is over as well! And now I am craving strawberries! Hmmm I love strawberries, your pictures make me smell them ! Patricia, I can't get enough strawberries and will be buying more before the season is over. More jam and more just plain eating is in store! Yummy, one can't have too many Strawberries in the Summer! I served chocolate covered strawberries over the weekend, they were yummy! My mother in law used to make strawberry freezer jam all the time, my son's favorite...maybe I should surprise him with some for his birthday at the end of the month! We made chocolate covered strawberries to give to every woman at church on Mother's Day. I think it will be a new tradition! What an exciting time! Lovely photos. Thanks so much! It was a fun photo shoot. 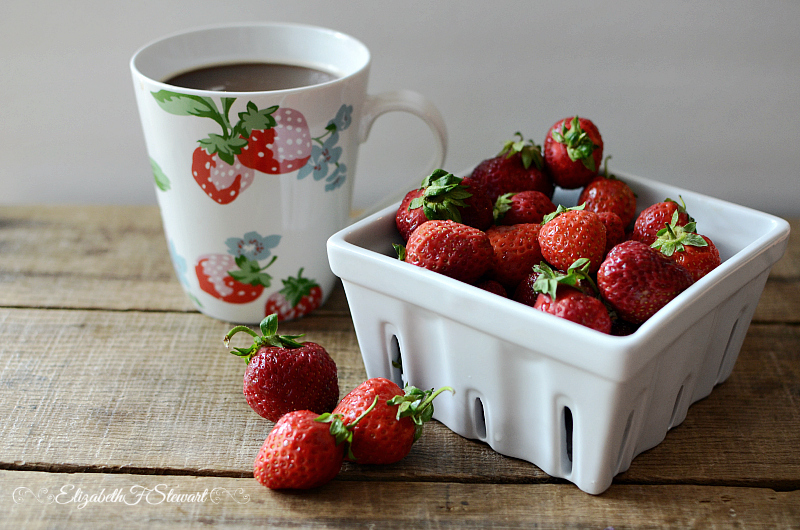 I really love how you have put this with your cute strawberry cup, Nothing like strawberries at this time of year. Best of Summer. 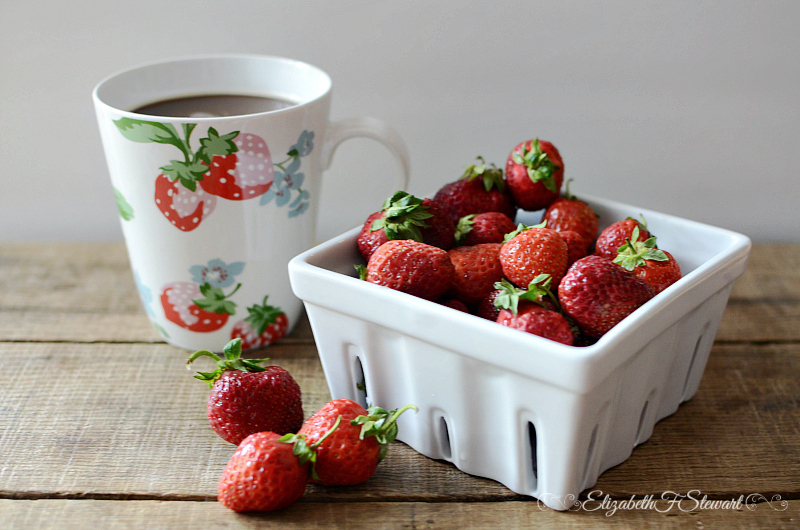 Barbara, when I got that new cup I knew that I had to shoot a still life with it when strawberry season came along! You always have the perfect props, Elizabeth! You make still life photography look so easy. . . yes, I'm sitting here trying not to covet, lol :) thanks for the recipes. We don't live far from Poteet, TX and they "do" strawberries there, too! Enjoy the berry season! June, I often shop and thrift with an eye open for things just for props! Ginger, those hand pies are quite delicious and tempting, but so is that roasted strawberry buttermilk cake. Some homemade strawberry ice cream would be good too. Actually, I could eat a whole sleeve of simple saltine crackers smeared with peanut butter and that delicious jam. And then I blame the extra lbs on menopause! Thanks for the encouragement on my photos, Cheryl. I need to make some more jam this week, so I'll be getting some more strawberries as well. Beautiful still lives. I especially like the last photo. 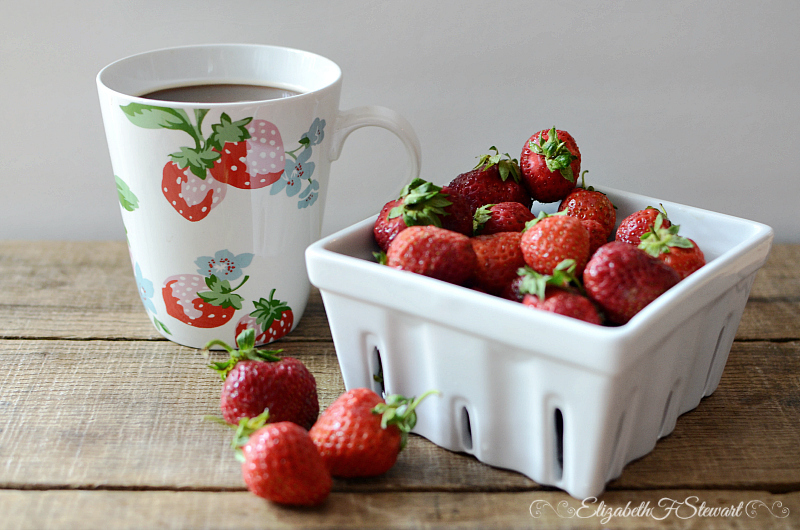 Great mug for strawberry season. Thanks, Earl! 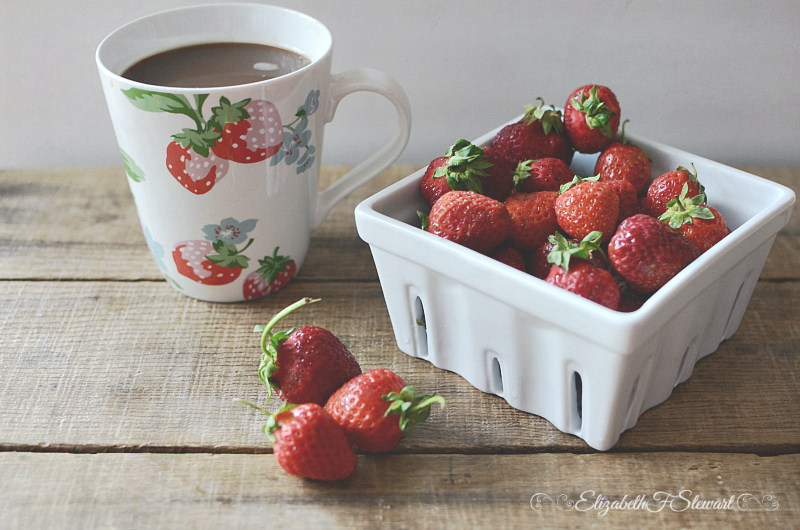 I'm pretty tickled with my strawberry mug, too! What lovely striking photos and delicious-looking berries. For MN, our season starts in late June and I can't wait to go to an all you can pick place. We also have some strawberries that are green but coming ibn my garden too. What fun, huh? Thanks for your encouragement, Jennifer. You're a blessing! I love my new mug too, Sharon! The berries look delicious! Can't wait until ours are in season. Love your mug! Thank you, Lynda. I love to play with still life photography! Yum...I love strawberry season. Your photos are beautiful!! Thank you so much, Mary Alice! 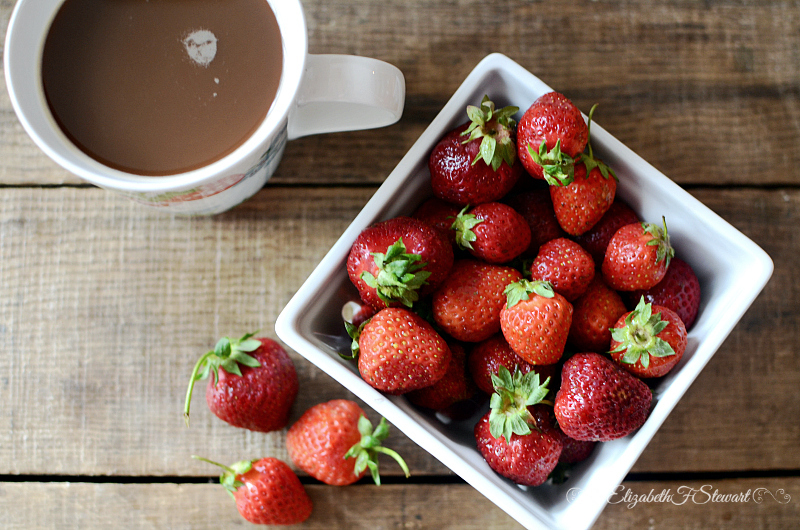 so pretty, we love strawberry season in our home too! Kristy, I'm about to go buy another flat of local strawberries before the season ends! Gorgeous photographs!! (My favourite is the fourth one. I really like that blurred background!) 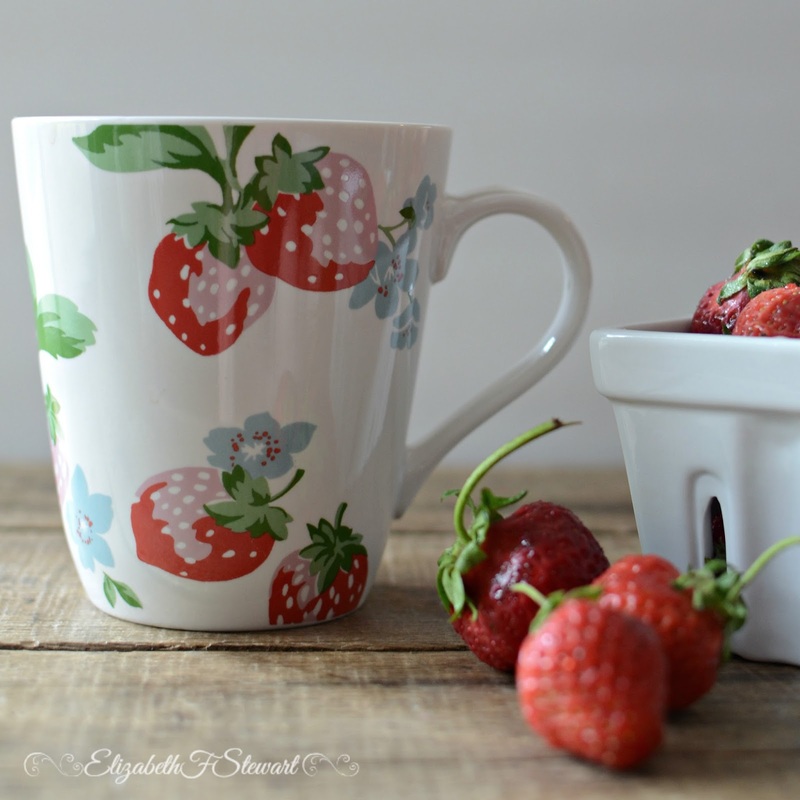 Love your still life setups - and love that mug! That photo is definitely one of my favorites as well.